Build the keyboard setup of your dreams. We combined all of the essential features you could want in a keyboard tray and mouse platform with the Humanscale 950 Standard Compact Keyboard Tray to keep you typing and your hands in the correct, ergonomic position. Swivel and adjust to your ideal height for the best in ergonomic support, all at your fingertips. 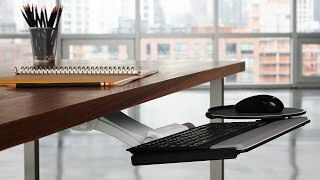 The Humanscale 950 Keyboard Tray design ensures that users type and mouse within their Neutral Reach Zone, creating a safe, comfortable, and sustainable work environment. Negative tilt keying assists your wrists, keeping them in a neutral or slightly pronated posture. Not only does this keep your wrists supported, but your hands and upper body get better ergonomic treatment, too, helping you stay well within your NRZ. Keyboard trays are one of the crucial pieces of an ergonomic workstation, so don't forget it when building our your ideal desk. The Humanscale 950 is now available with a Design Your Own option. The Humanscale 950 Standard Compact Keyboard Tray is available in black, white, or platinum. Both the keyboard mechanism, keyboard platform and mouse platform will come in the chosen color. Building a Humanscale keyboard system starts with finding the right mechanism for your setup. The mechanism determines the height adjustment and negative tilt for your keyboard tray. This mechanism's greater-than-average adjustment range is ideal for sit-to-stand workstations, featuring steel construction for stable keying and mousing. 8.5” High Clip Mouse (90H) sits 1.36" – 2.15" above the keyboard platform - our most popular option! The Humanscale 950 Standard Compact Keyboard Tray can be ordered with a mouse pad to match any of the available mousing platforms. Add a mouse pad to your optional second mouse platform if desired. Select from four different palm rest options for your Humanscale 950 Standard Compact Keyboard Tray: All are covered with an easy to clean, black synthetic leather and are 19 inches long. The 19 inch slim gel palm rest with synthetic leather cover is only about a quarter of an inch thick and is available in black or silver. Slim palm rests are not compatible with swivel mouse platforms. When designing your Humanscale 950 Standard Compact Keyboard Tray, if you choose to not add a palm support, there will be holes located at the installation points on the tray. About two years ago I dislocated a rib due to improper ergonomics at work. I'm shorter, which means most of my life I've been sitting completely wrong in order to reach my keyboard on top of my desk while keeping my feet flat on the floor. I was putting strain on my back muscles, and they became inflamed and basically pushed one of my ribs right out of my spine. This tray allowed me to fully recover, and never have problems again. I've owned both this tray and the larger 900 tray, and they're both fantastic. This particular tray is much smaller than the standard one, but I use mostly smaller mechanical keyboards and I don't need all of the extra space. I wouldn't recommend getting this tray over the 900 if you use a standard keyboard. Otherwise, it's fantastic and a little more compact than the 900. My biggest gripes with other keyboard trays is how wobbly they are, and the fact that you can't adjust the tilt. As long as you have a solid desk that won't wobble, the tray isn't going anywhere and can hold really heavy keyboards (I have some custom keyboards that are almost 8lbs, this tray holds them without a problem). I like to recline back in my chair, and basically pull the keyboard tray into my lap. It's insanely comfortable for hours at a time, and I can't do that with other keyboard trays. Imagine reclining back and having the keyboard right at your fingertips. I'm going to cover a few of the add-ons as well, in order. Hopefully it will make your life a little easier. 1, I got to pick a promotional item, and I own both the single monitor arm and the Uplift CPU holder. The keyboard really isn't that great of a value when compared to these items, unless you really dig the design. You really can't go wrong with the monitor arm, it's really handy. 2. For colors, I chose black. The wrist rest is black, but the tray itself is a speckled grey/black color, not a flat black. It looks like a pile of pepper that you sprinkled some salt over. I like the look, just be aware it's not completely black. 3. My tray uses the 6G mechanism, which is vastly superior to the other mechanisms (unless you have a specific scenario that warrants another one) and I wouldn't advise getting any of the other ones. You're already buying an expensive keyboard tray, don't cheap out on the main mechanism just to save a couple of bucks. 4. I have the gel wrist-rest, which is really comfortable but unfortunately starts to crack after about a year of daily use and will need to be replaced. Your mileage may vary, but for me it cracked right where I place my left palm. I'm hoping this one will hold up longer, but if not you can buy replacements and they swap easily. The gel is way more comfortable than the foam, so if you're on the fence then get the gel. 5. I decided against getting the lateral slider, because I didn't see myself needing it if the tray was placed correctly to begin with. 6. I went with the 10" High Clip mouse platform, and I love it. I previously had the 9", and it felt a little cramped when trying to mouse around my two monitors. Make sure to get the High Clip, since it's much easier to adjust. Mine sits above and actually covers a small part of my keyboard tray, but it's very comfortable. Most of the other mouse platform options are kind of pointless, in my opinion. They are wobbly and not nearly as comfortable to use as the High Clip. My ONLY complaint with this tray is the fact that the mouse pad is not as pictured, and totally different than it used to be. The older one is a traditional cloth mouse pad that you're probably familiar with, and the new one feels more like a very smooth, grippy foam or something. I admittedly like this pad better, but you get a completely different feeling when using a standard mouse pad. This might be an issue for some people. Also, note that this keyboard tray does NOT work with the Uplift track spacer that is sold on this website. The holes don't line up and it's a pain drilling your own. Luckily my standing desk has the ability to remove the middle bar, so I didn't even need to use it. Overall, I'm very pleased. These Humanscale keyboard trays are excellent for the money, and will last you for years to come. They're so much more sturdy and heavy than any of the cheaper options available out there, and they make life so much more comfortable if you get the right options.